I am following a ketogenic diet and carbs are very low. I get my energy from fat & ketones. Here is a basic primer on ketogenic diets if you are not familiar Ketogenic Basics . For the last couple months I’ve been doing a Protein Sparing Modified Fast (PSMF) on rest days from the gym to help fat loss. It has worked great except after 2 days around 1000 kcal Monday in gym can be rough to say the least. And to make matters worse, Monday is leg day, one of the most taxing training days. The past 3 leg days I have used a product from KetoSports, Keto CaNa. KetoCaNa contains 11.7 grams of the ketone body Beta-Hydroxybutyrate (BHB) per serving in a delicious orange flavored base. It contains no artificial sweeteners, flavorings or colors. Consumption of KetoCaNa before exercise can result in significant decreases in oxygen demand and increases in performance. What I have discovered is Keto CaNa delivers a very nice steady state of energy that really boosts stamina and helps offset the lack of strength from low calorie intake. Coupled with Keto8, an MCT oil, I feel unstoppable in the gym. I am doing a recompisition, losing fat while building muscle, and therefore calories need to tightly controlled. At only 68 kcal a serving for KetoCaNa, it is a big endurance boost with only a few calories, which I do account for. I also took KetoCaNa before my last heavy back day. Thursday (4th training day) is back day. And even here with a bit higher calorie intake (still deficit though) I noticed a marked increase in endurance. I was able to lift more reps at each different weight. Unfortunately KetoCaNa is on the expensive side, though a lower price with more Beta-Hydroxybutyrate (BHB) per serving then other similar products out there. I will be reserving it’s use to the two most taxing days, legs & back, but feel the benefits on these days out weigh the cost. If you are looking for an increase in endurance/staying power I would suggest you try KetoCaNa. I haven’t written anything in a while and wanted to jot down a few thoughts while I wait for my son to get done with hockey practice. Anyway, I wanted to touch on important ways to track progress besides a scale. A measuring tape is wonderful tool whether you are trying to lose or gain. Sometime this past summer I measured my bicep/tricep circumference and it was 13 1/4″ well I measured again now some months later and I got 13 5/8″ I’m so excited. Yeah its great that there is a change, but it’s really great because I was feeling like there’d been no change that I looked the same over the past few months. 3/8 wasn’t visually noticeable but the measuring tape does not lie! So take measurements and record and date them. Then you can have a record of progress that you may not otherwise notice! Posted on November 17, 2015 November 18, 2015 Categories UncategorizedLeave a comment on Making Gains! Jani Valtonen of the Finnish LCHF group contacted me for an interview. Jani: Tell me some basic info about yourself and your family. I am a 37 year old mother of two teenage boys 14 & 16. I have been married for 14 years. Currently reside in Ely, MN. I am employed as an assistant manager at a local gas station / convenience store, I also have two small businesses I run on the side involving horses. I am a natural hoofcare provider and natural horsemanship trainer. My boys are very athletic and are in sports year around (baseball, football & hockey, which they are have been playing since they were in kindergarten and preschool), they also are honor roll students. Jani: Sports career? What series of bodybuilding you are preparing (bodybuilding, fitness etc)? Is it your first competition or how many competitions have you had? I was prepping for a figure show in October but things have come up & I am now planning on a closer show next spring. This will be my first show. Jani: How long have you been keto? Jani: What brought you to try keto diet? What did you think about it at first? Were there any difficulties for you at the start? Was there anything that worried you in the start? I never was overweight growing up and it wasn’t until after I had my second child that I began to put on weight. As I settled into a life of big dinners and pie; I began working at a gas station with junk food always at my fingertips the weight started adding up. I tried south beach diet for about 3month and lost 20 lbs, but I was not ready for the time commitment in preparing meals and all that goes along with it fell off and regain the 20 I lost plus about 10 more. Fast forward about a year and I hated my body, I was sitting at 190 and 40% body fat. I was disgusted and depressed! I checked into a program called Take Shape for Life (TSFL) which used Medifast meal replacements for all meals expect the last meal which was a “lean and green” meal that you prepared yourself. It is a severe caloric restricted program avg 800-1000 kcal a day. It was here that I was first exposed to the idea of ketosis. I am a researcher, so I started learning about ketosis. The replacement meals were awful and expensive, so I lasted on the program for about 3 months, at which point I started weaning off of the meal replacements and into LCHF. There was one thing that worried me. When I started checking my blood glucose and ketones, my BG was 120+. I started taking an over the counter supplement called Glycosolve (works very similar to Metformin) and it worked great to get my BG down into the 70s. Around this same time I started to practice IF and you had to take Glycosolve with a meal, and since it was on the expensive side I just quit taking it. Around this same time frame I learned about Physiological IR and how it was a normal part of Ketogenic adaption. Lani: What do you think are the main benefits for you with keto? Do you think there’s any handicap you give to other competitors without eating high carbohydrates? There are many benefits for me with keto. The biggest, I think, is the fact that I no longer get sick and that my allergies have all but disappeared. My allergies had gotten so bad that I suffered from allergy induced asthma and I was fairly sickly, especially during the winter. I have not been sick in the two years since going low carb and my allergies in the practical sense are gone. I believe this is due to the anti-inflammation aspect of the diet. Being sick as much as I was, I believe has built up my immune system, but because of high level whole body inflammation, my immune system never was able to function properly; now however that has changed. As far as training goes I only see benefits there as well. I can train fasted with no low blood sugar swings and the need to refuel steadily. And as far as muscle building, people comment all the time that I have put on substantial muscle is a rather short period of time, and its all been done low carb so I see no draw back there either. Keto makes staying in a deficit easier, reduces hunger and has no negative impact on building muscle. I see no downside. Lani: Tell me about your training schedule. My training schedule has been all over the spectrum, never less than 5 days a week, and as many as 7. When I started lifting weights just about a year ago, I started right in with a 5 day body part split that was rather high volume. I am not going to lie, it was hard! I spent a lot of time crying because it was hard. But I kept on and didn’t give up. I eventually switched to 6 days and week then back to 5. At this point I was working off a program that a friend, Brian Walker had given me, and tweaking it as I needed to. This program was typical Bodybuilder Hypotrophy 3-5 sets 8-15 reps. No cardio. At about the 6th month mark I started working with a wonderful coach, Menno Henselmans. He put me on a 3 day program; it was not a typical split in any sense. I had the option of 1 rest day a week, but seldom took it. I think that in the 5 months I worked with him I took 3-4 rest days. Otherwise I just keep repeating the 3 day program. With this program the sets were 3-5 and the reps were custom to the muscle and determined at the very beginning of the program, anywhere from 6-20. As I got closer to show date cardio increased up to 50 minutes a week LISS. Currently I am working with Luis Villasenor and back to a 5 day body part split. This program focuses on the main compound lifts with added accessory work. I am just starting this program, not even two weeks in. I already enjoy the higher volume work and find the group and competition enjoyable. There is just 20 minutes LISS pre workout as a warm up. Lani: Do you have some kind of school of thought in your training and what kind? My only school of thought is lift as heavy as you can for the given volume. It should never be easy! You should be constantly pushing yourself and growing and never be afraid to step outside your comfort zone. Jani: Do you have a personal trainer and how often do meet him/her? Do you think it is possible to prepare for a competition without a personal trainer? I do not have a PT that I meet in person. I now have worked with 3 individuals long distance. This format has both advantages and disadvantages. I may have been able to advance quicker with things like squat and DL had I had someone right there with me to coach me on form. I have made it work, and its more satisfying knowing that this is done so much on my own. The advantages of course are that I am not limited to the PT trainers in my area. That I can work internationally with people, so location becomes less important. I think if you have enough knowledge about the industry and competition rules and expectations that you could prep without a coach, but for someone like me who is doing it for the first time, I feel a coach is very important. Jani: Eating, macros, calories, schedule etc. Favorite dishes. Any meals you miss? Any high carb meals you’ve ketofied? Use any carbs to boost energy or performance in the gym? I don’t really worry about meal schedule as much as I worry about getting all my macros in for the day or avg over a week’s time. I tend to cut to 1050 or so kcal on rest days. Meals I miss… sausage gravy probably the most. Otherwise I don’t miss fillers like bread or pasta at all, and enjoy eating more meat and veggies. When I first started, I ketofied all kinds of foods and all I found was that it made me want the real things even more or caused me to binge on those foods. I have found that I do best on simple repetitive meals, they make it easier to focus on found as fuel and not pleasure. I do follow TKD which is taking in 10-15g fast acting carbs just before train, like glucose or dextrose. I find this helps give a slight edge and help get that one more rep or push extra 5 lbs. It’s not magic but seems to benefit when you are pushing your body to the max during training. Carbs are not needed to build muscle as protein provides any beneficial insulin effect. Jani: Any lessons learned about low carb living? 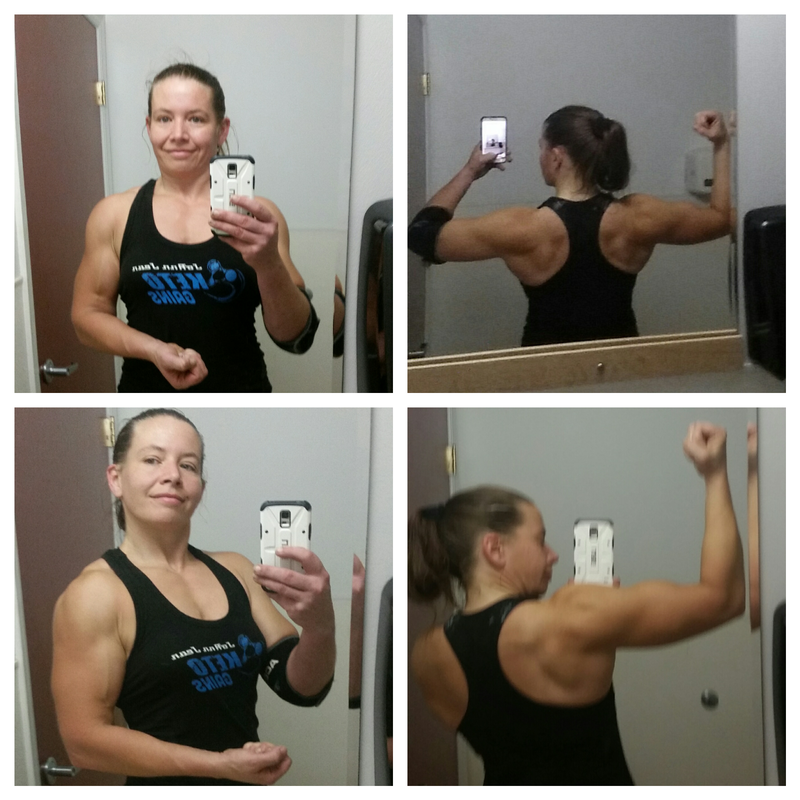 Do you have any advice for women who have never lifted where to start? Any sense in training while in a deficit? Why is lifting better for you then say cardio? Are there any keto friendly sites for women who are interested about lifting? I have learned a lot of lessons about low carb living! First it is not some magic plan where you get to gorge on fat and still lose weight, energy balance still matters. This means a diet that looks high protein is not necessarily so once you concider the fat being burned from body fat stores. Not to fuss with measuring ketones or blood glucose, unless you have a medical reason to do so, such as diabetic or epileptic. Just eat follow the diet and let it work! That protein needs to be based on lean body mass and not on activity and you certainly can eat too little, however it really is hard to eat too much unless you are eating protein shakes and bars instead of whole food sources like steak. My advice to woman who are interested in lifting weights, “Don’t be afraid to lift heavy and get off the treadmill!” I would start with a good strength building program such as Starting Strength to create a solid base before specializing in any specific direction. Lifting and cardio really serve two different functions. Lifting increases lean body mass and cardio improves cardiovascular health and serves to increase a deficit (during weight loss) without decreasing food intake. I actually have gained most the muscle I have while I was in a deficit. When you have a high body fat percent and are a new lifter especially, you have an advantage to be able to more easily gain muscle while losing fat. This process gets exponentially harder as your body fat percent decreases and the time you have been training increases. The best site I think for weight lifting and keto, no matter if you are a man or woman, would be KETOGAINS. Found both on facebook at KETOGAINS and ketogains.com. This group of people is wonderful and fully accepts woman as well as men! It’s a very positive and supportive atmosphere! Beginner to advanced, all are welcome! Jani: Do you know anything about Finland? Something we should know about your home state? The first Finnish immigrants to the USA arrived in 1864, when Finns from northern Finland and Norway settled on the homestead prairie lands in south central Minnesota, my home state. And I have Finnish roots. My Great Grandma Limpy Maria came over from Finland with her family when she was a young girl. I have memories of my Grandma and Great Grandma talking in Finnish whenever they did not want us grandkids to know what they were talking about! If I ever decided to move out of the USA I would be very interested in going to Finland as I really believe in a lot of what is done there as a country. When one thing ends, it opens the door for a new begining. And so it is that as I switch gears away from competing this fall, I am moving into a new program and training. I am excited as I begin training with Luis Villasenor!! First back day on the books and it was great! With a bit more intensity and volume and less rest time then I was doing previously. You know when you’re light headed and vision is blurry that you’re working hard! Here’s to a new road to travel and new barriers to break!